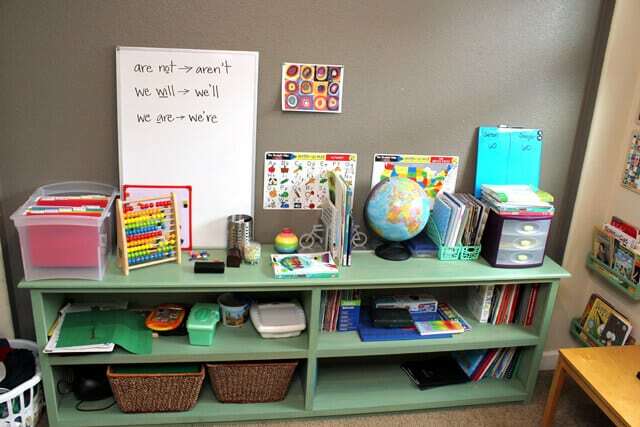 …and after a few weeks of school, the walls were nearly bare, and the shelves were an unorganized mess! I knew that I needed to get the clutter under control in order to keep our days running smoothly, so I reached out to my friends at Oriental Trading Company and asked them for some help. I’m sure you probably already associate Oriental Trading Company with their huge selection of party supplies and novelty goods, but did you know that they also have a TON of great craft and school supplies, too? Oriental Trading Company sent me a box full of goodies to review, and I couldn’t wait to get them all set up in our school room! 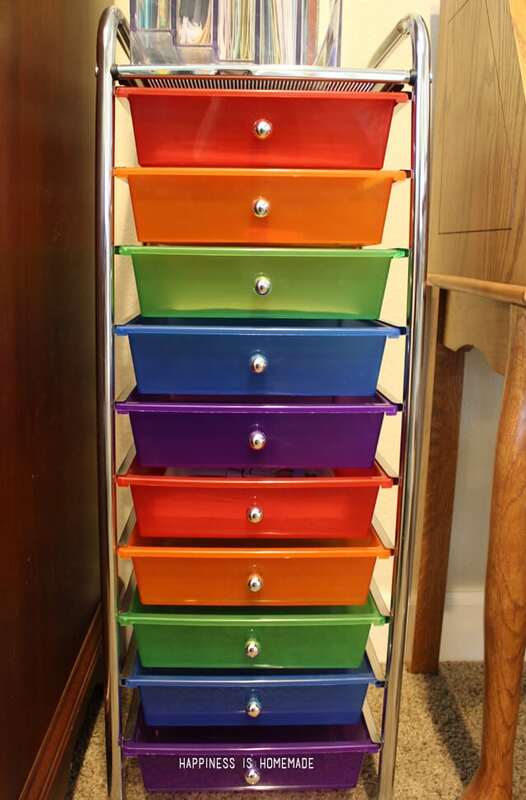 We use a set of colorful plastic drawers as “workboxes” for my older two boys, and I wanted to continue with the color coded theme for the rest of the space. Every night I fill the drawers with the boys’ work for the following day (1 subject per drawer; 5 drawers per boy), and the next morning they go through the drawers in order, working at their own pace until all of the work has been completed. Many times we work on group lessons together, but some days they work independently, so this is a great way for them to visualize the agenda for the day and see how much work they have left. To keep with the color coded nature of the workboxes, I got these book storage bins from Oriental Trading Company, and I can’t even tell you how much I love them! I was worried that they might be a little too flimsy or lightweight to hold all of our heavy text books and school work, but I was pleasantly surprised by how heavy duty they are. 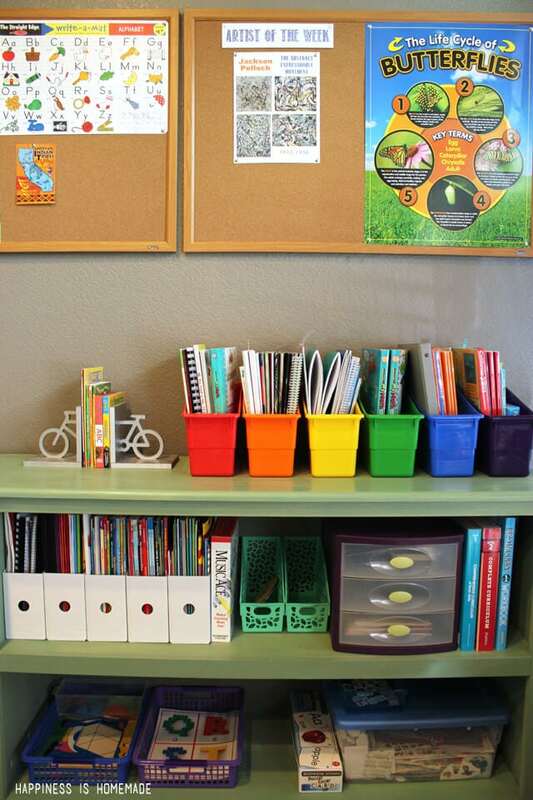 These keep everything in plain sight and easily accessible, but still organized and clean looking. I seriously want to pick up another set or two for my other shelves now! 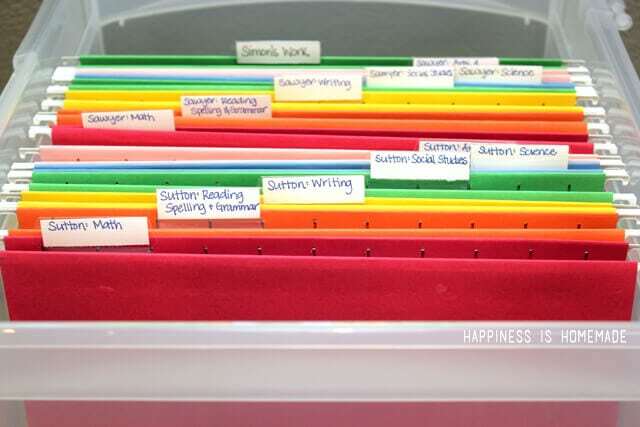 I use a plastic file box and color coded hanging rainbow file folders to organize the boys’ completed school work. As they complete their workboxes during the day, I correct and stamp their papers, and then they file them in the appropriate folder. 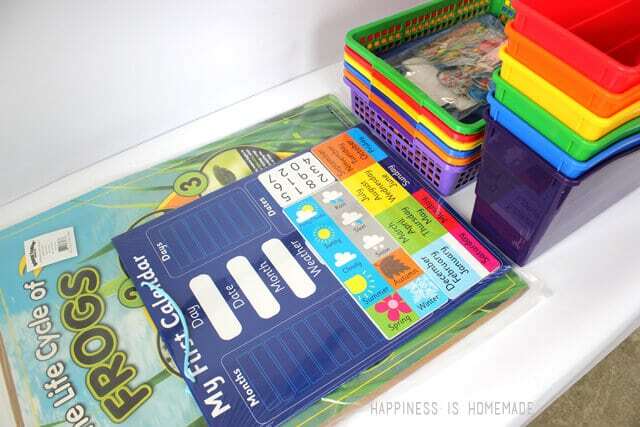 Making filing part of the boys’ daily routine has definitely helped to keep the space tidy and better organized. Doesn’t this look much more organized than it did a few weeks ago?! See those white cardboard magazine files on the second shelf? 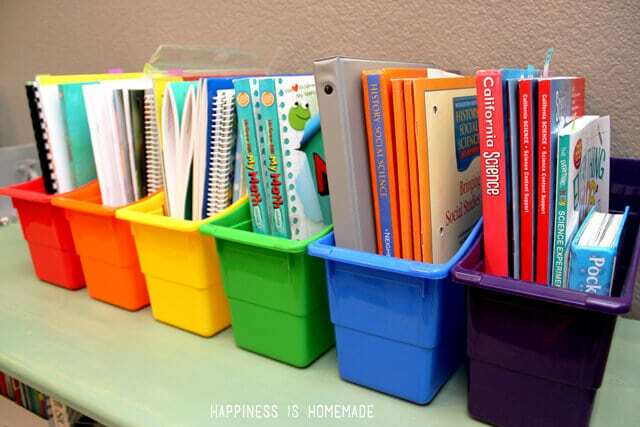 That’s where I’d like to put an additional set of those awesome rainbow book storage bins since they’re much sturdier (and prettier!)! 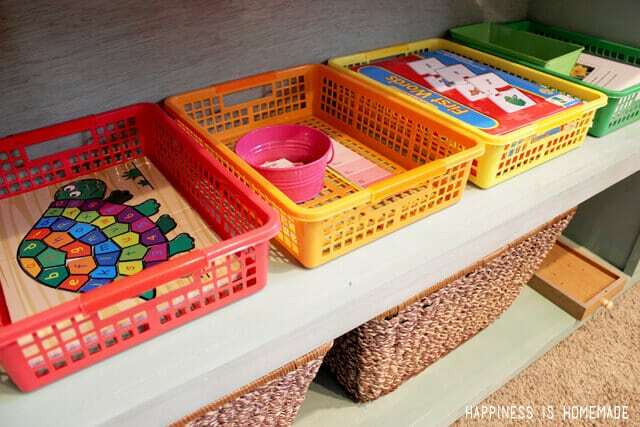 The other shelves are now home to Oriental Trading Company’s classroom storage baskets filled with Simon’s preschool activities. He’s quickly learning that he is only allowed to take one activity off of the shelf, complete it and put it away before he can get out another one. The baskets work great to keep his work accessible on his level, and they make cleaning up even easier since all the parts and pieces of each activity fits nicely inside the basket. Like the book bins, these are also much sturdier and heavy duty than I had expected (yay!). Plus, they have handles, which is a huge bonus for little hands carrying them back and forth to their work table! 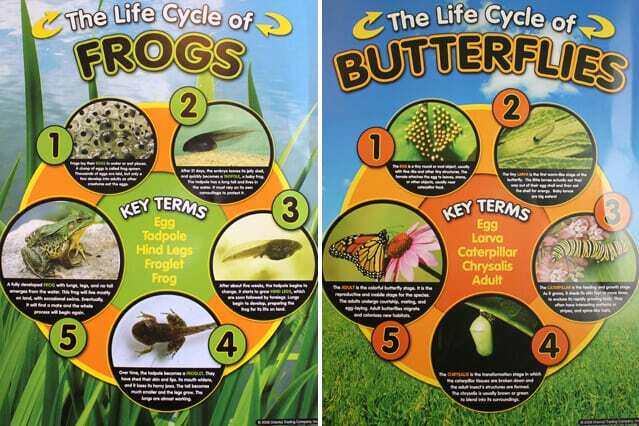 On our bulletin boards we have The Life Cycle of Frogs and Butterflies from the Life Cycles Learning Poster Set on display since they coincide with our current lessons, but all four of the posters in the set are beautifully done (the other posters are the life cycles of chickens and pumpkins/plants). They each highlight new vocabulary terms and show brilliantly clear photos of the metamorphoses happening. Simon’s favorite part of the morning is updating his new My First Calendar magnetic chart. He loves to change the dates and the weather, and he’s always quick to remind me in the morning that it’s time to update the calendar. We also have a standard calendar hanging up in our kitchen, and he likes to cross reference it to see where the date and day of the week fall on the grid style. Our library books and current quiet reading selections are kept in spice rack bookshelves on the wall or between these funky bicycle bookends on top of the bookshelf. 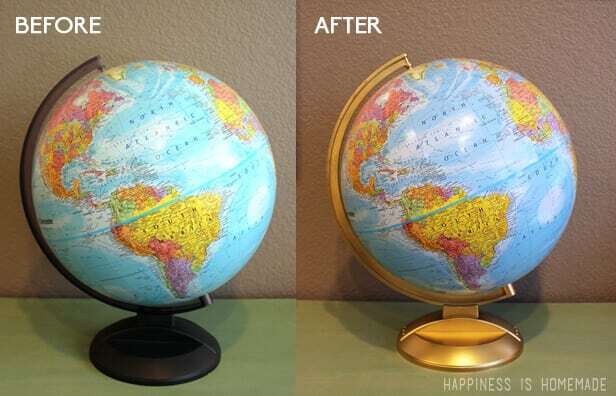 I even gave our boring plastic globe a quickie gold spray paint makeover to give her some glitz and glam! I am so happy with the way that the room is coming together, and I want to say a HUGE thank you to Oriental Trading Company for providing us with products that are perfect for our space! Next up, I’m ready to tackle sewing some curtains to filter the bright morning sunlight and finding two new stylish chairs for the farmhouse table! Disclaimer: I was provided with product samples free of charge by Oriental Trading Company, and I provided my honest opinion and review. No other type of compensation was received for this review. This review is based strictly on my opinion. Others may have a different opinion or experience with the product listed above. That looks so good! I had no idea OTC had organization stuff! 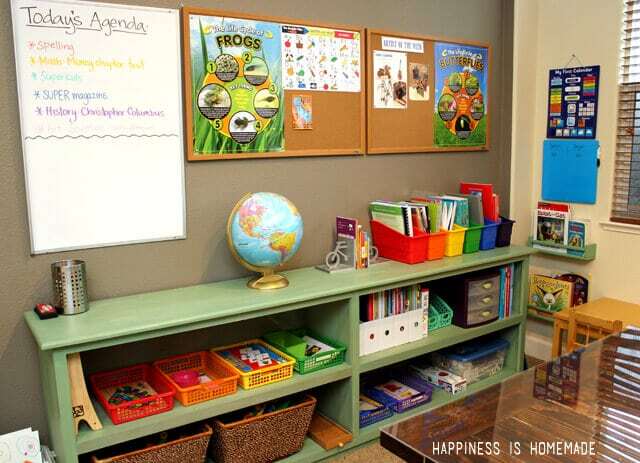 This room is looking so awesome – and I can totally see how your kids would be so motivated to learn in this space. Great job! Thanks, Liz! We’ve been having a ton of fun in here! your room looks AMAZING! 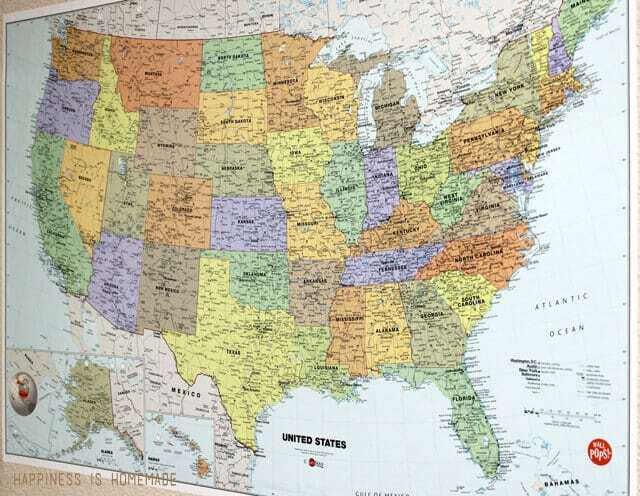 what suggestions do you have specifically for someone getting ready to home school for the first time? 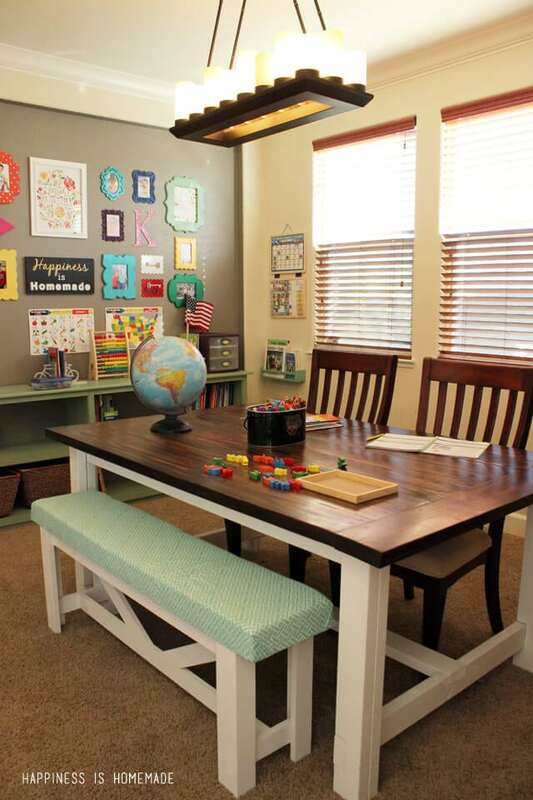 what are the most important components of a dedicated homeschool space? im really looking forward to making something unique and stimulating for my five year old. i also have a baby to entertain so i have to keep that in mind while designing. thanks! I love your room, but specifically your long, low book shelf. It’s exactly what I’ve been looking for in our room. Did your husband make it? If so, would you mind sharing your plans (if you haven’t already, I have poked around your blog and didn’t find anything). Thanks, Melissa! The light fixture is Allen + Roth from Lowes! Awesome! I have been looking for something similar for my island. It looks like the light shines down underneath as well. OTC no longer has the Magnetic Calendar. I wonder why they would discontinue such a cool item! Oh well…. There are similar ones on Amazon, but not quite the same. I love the room! Can other people request sample from oriental trading to help with organizations goods for classroom? I love it. 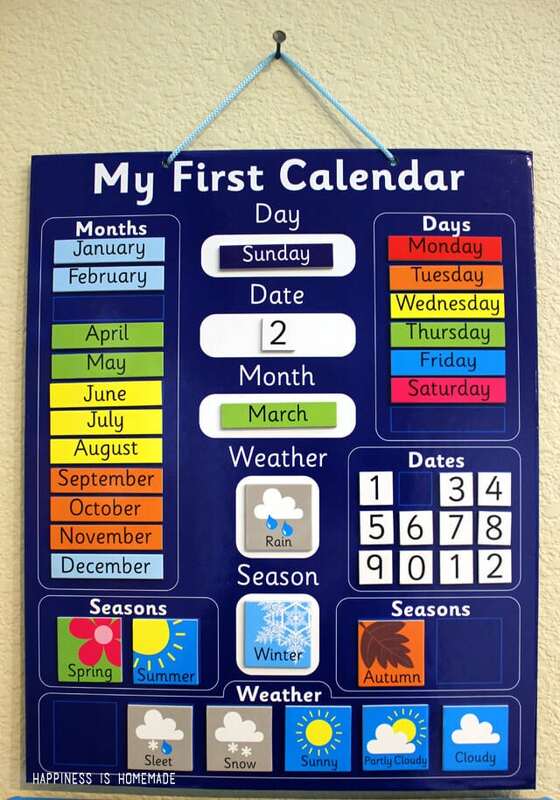 Would like to find about the first calendar great for school trips? Do you know if other site that offer it? What type of history and writing books or games do you used! 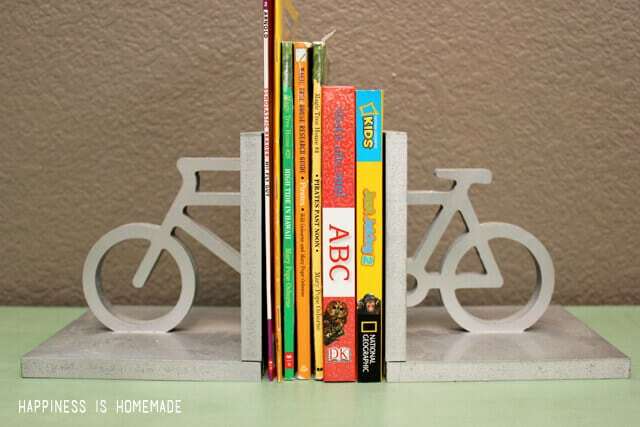 I absolutely NEED those bicycle bookends! Where can I find them?